The science behind solar energy was first introduced by Albert Einstein over a hundred years ago. Continuous advancements in science and technological improvements have refined and enhanced the systems into what we see today. These advancements make today’s systems more effective and more efficient than ever before. Equipment to securely house solar panels at ground level. Gathers system data and tracks how much your panels produce. Converts DC power from the array to AC power for your home. Utility device for measuring the flow of electricity. Network of equipment connecting power consumers to power producers. The amount of sunlight that shines on the earth in less than one hour can provide enough energy to power the world for an entire year! 1) Solar electric photovoltaic modules, commonly known as solar panels, capture and convert that sunlight into Direct Current (DC) electricity. 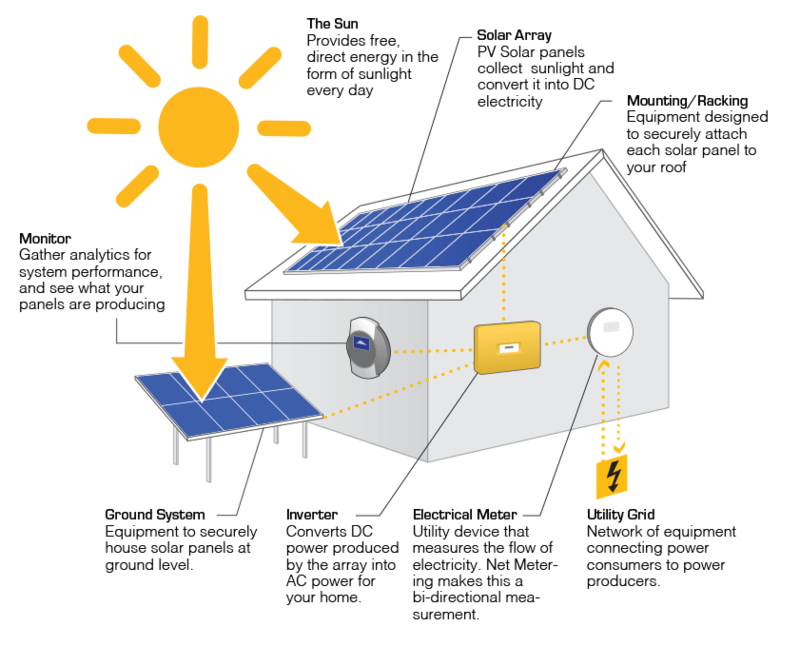 2) DC electricity is then sent to a device called a PV inverter which converts the DC into AC electricity. 3) AC is the standard electricity that will be routed through the breaker box and used to power your home or business. 4) When your system generates more energy than you use, your excess energy goes out to the grid and is recorded as clean energy produced. 5) Energy produced for the grid will be treated as credits you can use to offset the cost of energy you use from the grid each month.